Physical Characteristics: Northern right whale dolphins are almost entirely black with a white patch that stretches from the throat down to the fluke notch. Younger dolphins have more of a gray color initially. This species is the only small cetacean to have no dorsal fin, making them unmistakable when seen closely. Each animal has around 37-54 pairs of teeth in each jaw. Feeding: The most common prey for these animals include squid and lanternfish. (This is most common for those residing in waters off of Southern California) Other prey items include various type of fish and cephalopods. Life cycle: The life cycle of northern right whale dolphins has been best studied in the central North Pacific which was based off of a large number of animals killed in squid driftnet fisheries. The calving peak appears to be in the late summer around July and August and females have calving intervals of around 2 years. The gestation period lasts around 12 months and both sexes reach sexual maturity around 10 years old. The life span of the northern right whale dolphin is up to 42 years old. Behavior: Northern right whale dolphins travel in schools ranging between 100 and 200 animals, however they have been noted to travel in a group of up to 3,000. 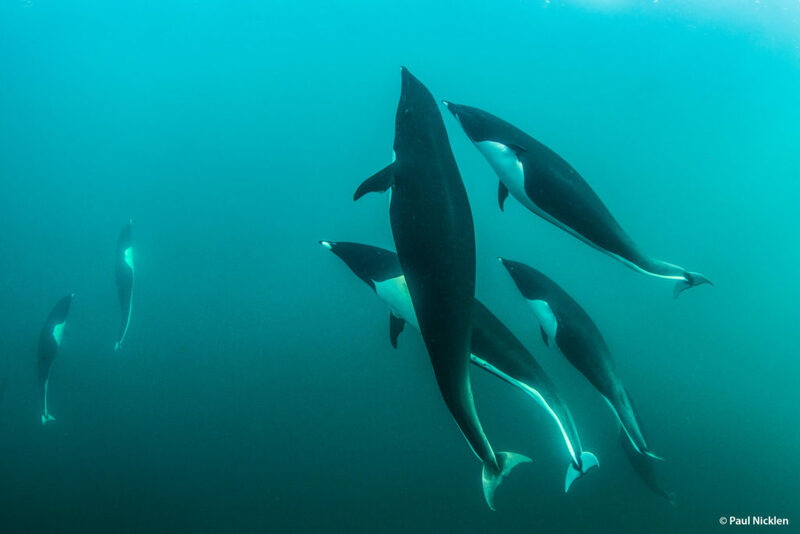 The groups are tightly packed and have been known to group together with other marine mammals; most commonly Pacific white-sided dolphins and Risso’s dolphins. Northern right whale dolphins are very fast swimmers and often surf in the waves created by boats when in the company of other species. Distribution: Northern right whale dolphins are most commonly seen in the North Pacific only where waters are more cool and temperate. They are also common near submarine canyons and rarely ever seen in certain areas such as the Sea of Japan. They are considered more of a non-tropical species. Their habitat range goes from the continental shelf outward. Threats and status: Norther right whale dolphins often fall victim to accidental capture in various types of fishing gear meant for other species. Currently it is estimated there are around 68,000 in the North Pacific with roughly 20,000 residing in areas off the coast of Oregon, Washington, and California. Source: Jefferson, Thomas A., Marc A. Webber, and Robert L. Pitman. Marine Mammals of the World: A Comprehensive Guide to Their Identification. London: Academic, 2008. Print.